SQL server backup is fully automated with Handy Backup software. It has a dedicated plug-in for any SQL version, allowing saving databases as compressed binary dumps with all components and settings preserved. As a perfect SQL backup tool, Handy Backup can also schedule and tune these tasks. Unlike SQL Server backup software utilizing ODBC drivers, Handy Backup works with the DBMS directly via the MSSQL backup plug-in and lets you to save SQL databases with all included views, indexes, stored procedures, etc., as well as always to restore them intact. Handy Backup allows taking snapshots of MS SQL databases without stopping a server. This technique, called hot backup, reduces both server downtime and user distractions. Of course, you can always backup SQL server in stopped mode (i.e., take cold backup) if you need; there are no restrictions. Backup SQL Server 2005, the classic but almost obsolete. Backup SQL Server 2008, the mainstay for many enterprises up to a day. 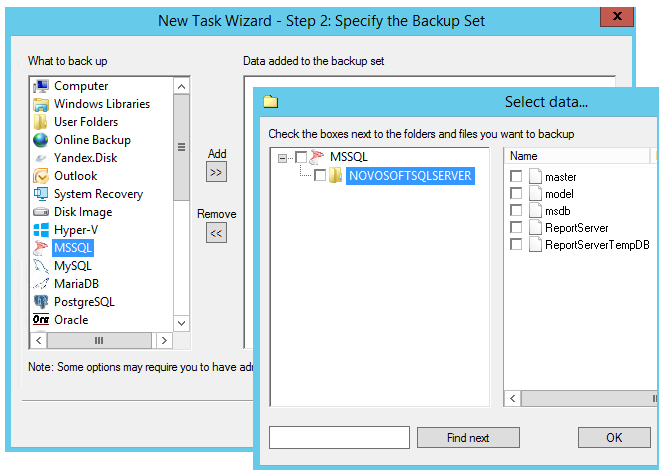 SQL Server 2012 backup, a good and well-equipped modern solution. SQL Server 2014 backup, a popular modern Microsoft DBMS. SQL Server 2016 backup – for the newest and hottest version of MS SQL Server. As unified SQL Server backup software, Handy Backup uses the same interface to work with all versions. You can also organize joint SQL backup with any other server-grade or user-level data (e.g. website content via FTP, files, folders and so on), using just the same task to set up copying all this information. Scheduling tasks by a period, to exact time or by plugging an external USB drive. Note: Incremental database backups can be too bulky and always take a lot of time when restoring. Therefore, we are strongly recommending using differential or mixed methods instead of incremental for SQL Server backup database. Still, you can freely use incremental backup if you need it! These crucial advantages, among many other Handy Backup features, made it most quick and reliable SQL backup software for different versions of SQL software. The Small Server solution performs greatly as perfect SQL database backup software, along with taking other server-level and user data backups. Before programming your SQL backup tool for a particular task, you can optimize your backups by taking into consideration the three simple factors. How Frequently the SQL Database Changes? Take a differential backup each time when your database content will change by a significant grade (e.g. by 10%). If this time measures in minutes, back up, say, every 10 minutes. If this takes hours or days, make daily backups. How Important the Database Content Is? For any important (e.g. commercial) data, take full backups at least one to two times per day, perhaps every hour. For less important databases, plan your backup at least one to two times per week, or take snapshots daily (e.g. after the main worktime ends, say, at 9:15 pm). How Big Are Database Backups? If your backups are too bulky, use external USB drives or local NAS/mapped drives to store copies of these databases. For smaller databases, you can back up to commercial clouds, ever available for uploading/downloading data and comfortable to use. Note: Best SQL Server backup software always consider storing same backups at least on two different locations, one linked to a server and other placed somewhere offsite (e.g. 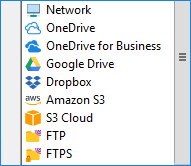 on a cloud or remote FTP). Just copy one backup task to another and then change the second task destination to make such tasks! Transferring SQL data by networks can be potentially dangerous. To protect your data packages, you can use VPN and/or SFTP/FTPS secured protocols. 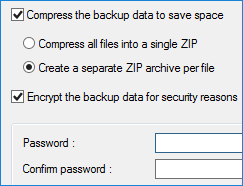 In addition, Handy Backup automatically compresses any SQL database when backing it up. Finally, you can achieve extra compression into a single or multiple ZIP files for all your backup content in a particular task (not only a SQL database). You can use a built-in SQL backup program, or write some SQL backup script to take a copy of your database(s). Both these methods require additional skills and knowledge, and we are not recommending these methods to a common user or unskilled administrator. Alternatively, Handy Backup is a simple and reliable SQL backup tool. Any user who have beginner-level skills at Windows can effectively create backup and restoration task with it, even for such a difficult matter that the SQL server backup is. Have a nice job!